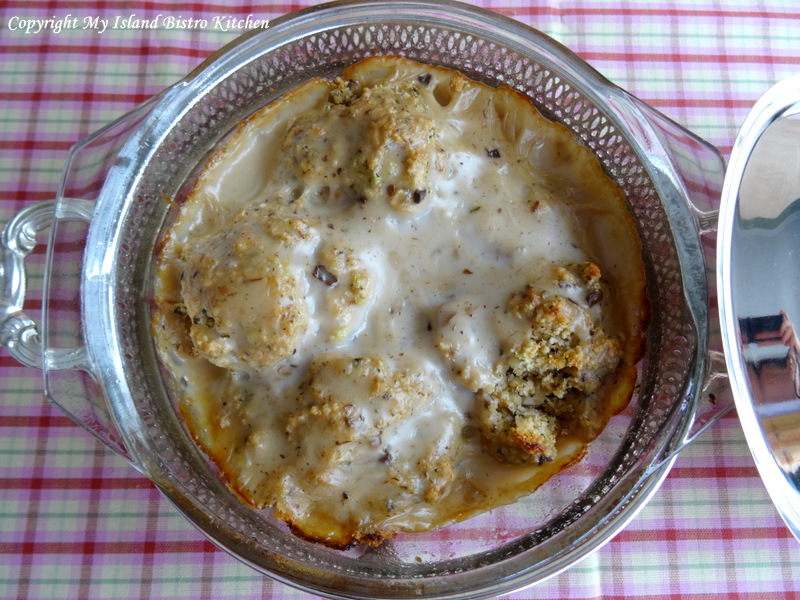 Quite some time ago, I shared my standard “go-to” recipe for basic poultry stuffing/dressing. At the bottom of this posting, you will find the link to that recipe and an explanation for the difference (if you don’t already know) between stuffing and dressing. In this Sweet and Savory Sausage Bread Stuffing recipe, I have jazzed up the stuffing by adding sausage meat to it. Dried cranberries can also be added so long as they have first been plumped in some warm rum (or warm chicken stock) for 10-15 minutes. Otherwise, the cranberries can be a bit hard and chewy in this stuffing. The cranberries are an optional ingredient but they do lend a pop of color and texture to the finished product. I sometimes, though not always, add them in. The sweetness in this stuffing comes from both the chopped apple and a bit of maple syrup which also adds to the moistness of the stuffing. What gives this stuffing its unique flavour is the kind of sausage used. My local butcher shop (KJL Meats in Charlottetown) is known for its creativity in making sausages. To get the best choice, it means an early visit on Saturday mornings when they have their best selection available. I have a couple of favorites I gravitate to for bread stuffing/dressing and they are sundried tomato or honey garlic sausages. Other flavours may, of course, also be used, according to personal taste preferences. I remove the sausage casing and break up the meat then lightly scramble fry it with the aromatics (onion and celery) for 3-4 minutes, or until the meat is no longer pink. Here, in PEI, the seasoning of choice for many folks when it comes to poultry stuffing/dressing is the herb called summer savory and that’s what I use in my stuffing/dressing recipes. In my household, it would not be considered to be stuffing/dressing unless it is made with summer savory! Old traditions prevail! This recipe should yield approximately 4-5 cups of stuffing/dressing, depending on how dry/wet the potatoes are when cooked and the texture of the bread crumbs used. The recipe, however, is easily scalable so it can be doubled, tripled, halved, and so forth to meet the size of the chicken or turkey. To make this recipe gluten free, simply substitute gluten-free bread crumbs in the same amount called for in this recipe and ensure that all other ingredients called for are also gluten free, including the sausage and liquid chicken bouillon. Some butchers, like KJL Meats, do make gluten-free sausages. I save all the crusts from gluten-free bread and then use my food processor to crumb them coarsely for use in stuffing and then freeze the crumbs in airtight freezer bags for use as needed. Melt butter in small frypan over medium heat. Add the onion and celery. Briskly stir the vegetables for 2-3 minutes. Break apart the sausage meat and add to the onion and celery. Scramble fry the sausage meat until no longer pink, about 3-4 minutes. Place the warm mashed potatoes in a large bowl. Sprinkle with summer savory. Add the onion, celery, sausage, and chicken bouillon. Mix. Add the dried cranberries and chopped apple. Mix in the bread crumbs along with the melted butter, water, maple syrup, parsley, and chives. Stir to combine. Season with salt and pepper to taste. Loosely fill the body cavity of turkey or chicken with the stuffing. Roast turkey/chicken according to package directions for stuffed poultry and use a food thermometer to ensure that both the poultry and the stuffing have reached the safe minimum temperature. Alternatively, make the stuffing into dressing by lightly pressing the mixture into one or two greased tinfoil-lined loaf pan(s). Cover with tin foil and bake in 350°F oven for apx. 15-20 minutes then remove tin foil and bake for 10-15 minutes longer, or until lightly browned on top. Let cool in pan(s) for at least 15 minutes then lift the tinfoil out of the loaf pan(s) and slice the dressing. NOTE: Depending on how wet the variety of potatoes may be when cooked, additional bread crumbs may be needed to achieve the desired texture of the stuffing. This moist sweet and savory sausage bread stuffing is made with sausage meat, bread crumbs, summer savory, apple, cranberries and maple syrup. The perfect side dish to roast chicken or turkey dinners. NOTE 1: Depending on how wet the variety of potatoes may be when cooked, additional bread crumbs may be needed to achieve the desired texture of the stuffing. NOTE 2: To make this recipe gluten free, simply substitute gluten-free bread crumbs in the same amount called for in this recipe and ensure that all other ingredients called for are also gluten free, including the sausage and liquid chicken bouillon. 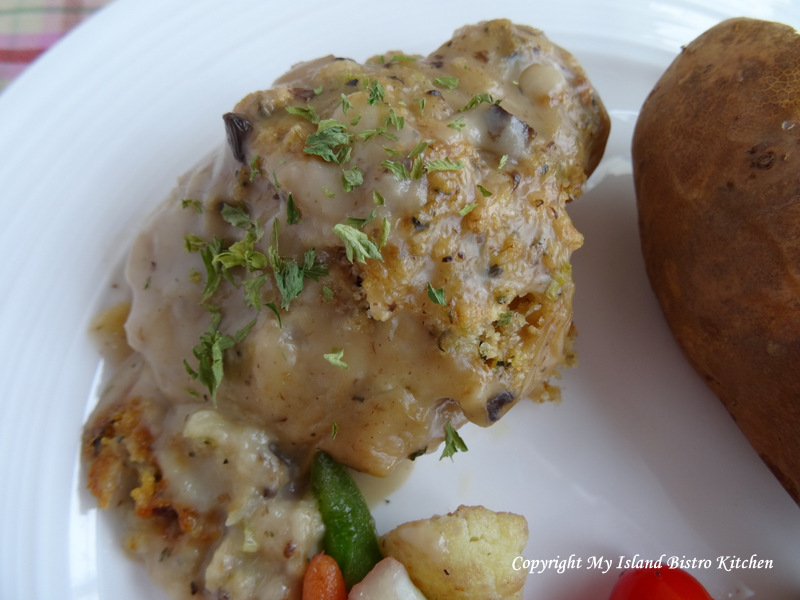 For my basic poultry stuffing recipe, click here. There is nothing like the scent of a turkey roasting in the oven! I love a roast turkey dinner with all the trimmings and I especially love the bread stuffing or, you may know it as “dressing”. The theory is that, if it goes inside the turkey cavity, it’s called “stuffing” but, if it is cooked separately (as in a casserole or loaf pan), then it’s called “dressing”. Regardless what it’s called, it just would not be a roast turkey dinner without this wonderful savory side dish. 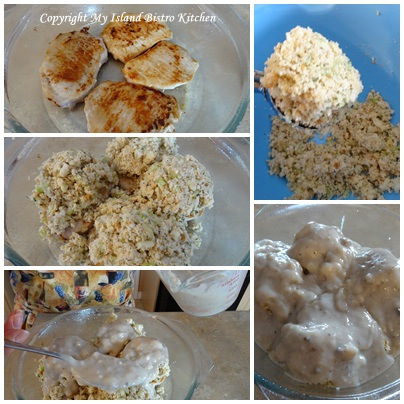 There are many ways to make the turkey stuffing and many different ingredients and seasonings that can be used. Here on PEI, the most common seasoning is summer savory. In fact, this is a herb I grow in my garden. My grandmother always grew this herb, dried it, and hand-crushed it for use in stuffing/dressing throughout the year. Old traditions prevail! Some folks make a stuffing that is quite dry and crumbly while others, like myself, make a version that is more moist. Some use bread cubes while others use either coarse or fine bread crumbs. I save up the crusts from bread, store them in my freezer, and then, when I have lots, I use my food processor to process a bag of fine bread crumbs that I keep in the freezer to have at the ready to make stuffing at any time. It’s a big time saver, particularly if you frequently prepare roast chicken or turkey dinners. The bread crumbs can be all one kind or a mixture of different breads – white and whole wheat or multi-grain, for example. In fact, the last stuffing/dressing I made, I used gluten-free bread crumbs. I know some frown on placing the stuffing inside the turkey but I always do because it gives the turkey such lovely flavour as it roasts. It takes a little longer for the turkey to cook but I find it is so worth it. Alternatively, the stuffing (er, dressing, in this case) can always be baked in a casserole or a loaf pan. I like to use a loaf pan if I am wanting nice slices of the dressing for a turkey platter for, say, a buffet. It looks neat and attractive and the dressing is easily picked up with a serving fork. It’s important that the mashed potatoes be warm, not cold, when making the stuffing. You want to capture and retain the moisture from the potatoes for the stuffing and it is much easier to mix warm potatoes than cold. How many bread crumbs needed will depend, in large part, on how wet the potatoes are. Some potato varieties are quite dry when cooked so won’t need as many bread crumbs as will potatoes that cook up wet. Start with a couple of cups of soft fine bread crumbs and, if more are needed to reach the desired consistency, add the crumbs a tablespoon or two at a time. Now, by “fine” bread crumbs, I don’t mean fine as salt like the ones you would probably find on a grocery store shelf or at a bulk food store and which would be used to bread chicken or fish. For use in stuffing, the crumbs need to have a little coarseness and bulk to them. I add a bit of celery and onion for added flavour and some chopped apple to give the stuffing/dressing a bit of sweetness. I also use a small amount of liquid chicken bouillon concentrate as this really enhances the flavour but does not add unnecessary liquid to the mixture. It’s important not to pack the stuffing tightly into the turkey – just loosely fit it in. I find using a piece of greased tin foil to make a “cradle” with sides inside the cavity for the stuffing to lay on makes it easy to remove the stuffing once the turkey comes out of the oven. Grab hold of the ends of the tin foil and, with a gentle pull, out will come the stuffing intact. This allows the turkey to flavour the stuffing and vice versa but makes it easier to remove the stuffing rather than having to massacre it with a spoon in the process of trying to remove the stuffing. Mix all ingredients together and loosely fill the body cavity of the turkey or chicken with the stuffing. Roast turkey/chicken according to package directions. Alternatively, lightly press mixture into greased loaf pan. Cover with tin foil and bake in 350F oven for 20 minutes then remove tin foil and bake for 10-15 minutes longer, or until lightly browned on top. Mix all ingredients together and loosely fill the body cavity of turkey or chicken with the stuffing. Roast turkey/chicken according to package directions. 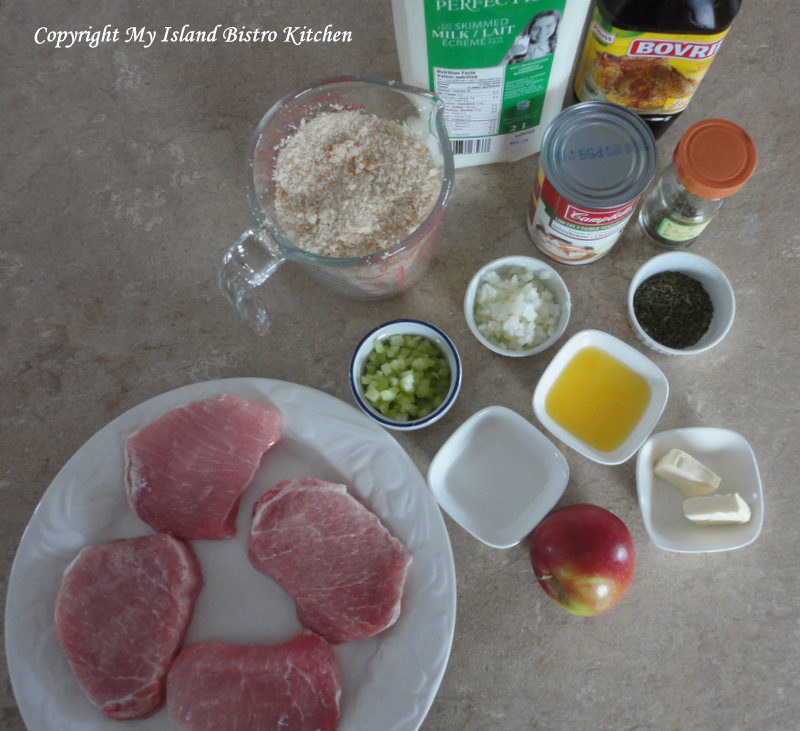 Today, I am sharing a recipe for one of my favorite ways to serve pork chops. It’s very simple and easy to make and uses very few ingredients, none of them uncommon or hard to find. In fact, many cooks likely already have the ingredients in their kitchens. 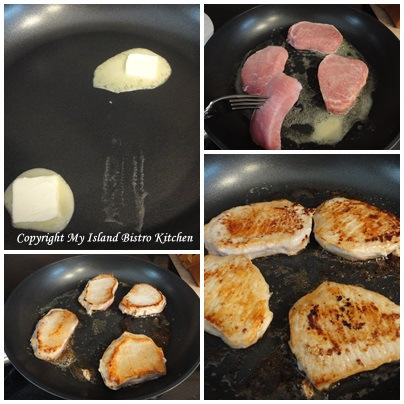 I find this is a good recipe to use to tenderize pork chops and it works with any cut of the meat, boneless or with bone in. The soup sauce also keeps the pork chops moist. The recipe is quick and easy enough for a weeknight meal but can also be served as company fare. Make a simple bread stuffing (be sure to use fresh, soft bread crumbs). 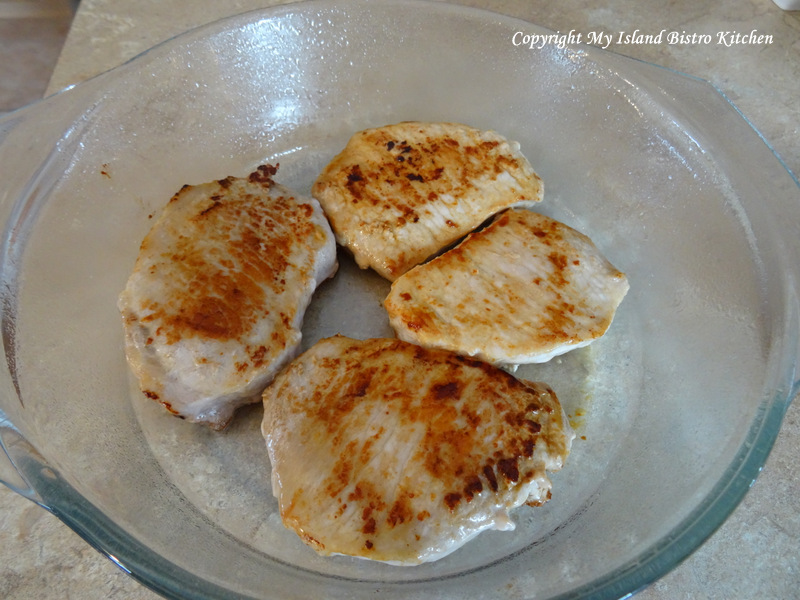 Brown the pork chops quickly in a frying pan, then transfer them to a baking dish. Top each chop with a generous amount of the stuffing. 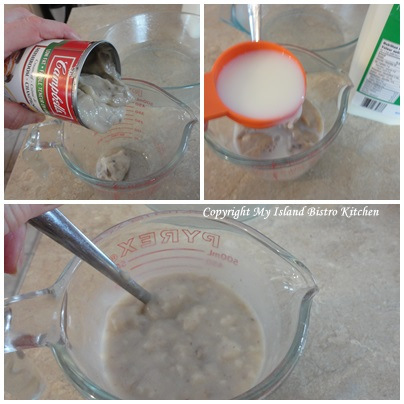 Mix a can of cream of mushroom soup with a small amount of milk and pour over the pork chops and stuffing. Dinner in about 1 hour. 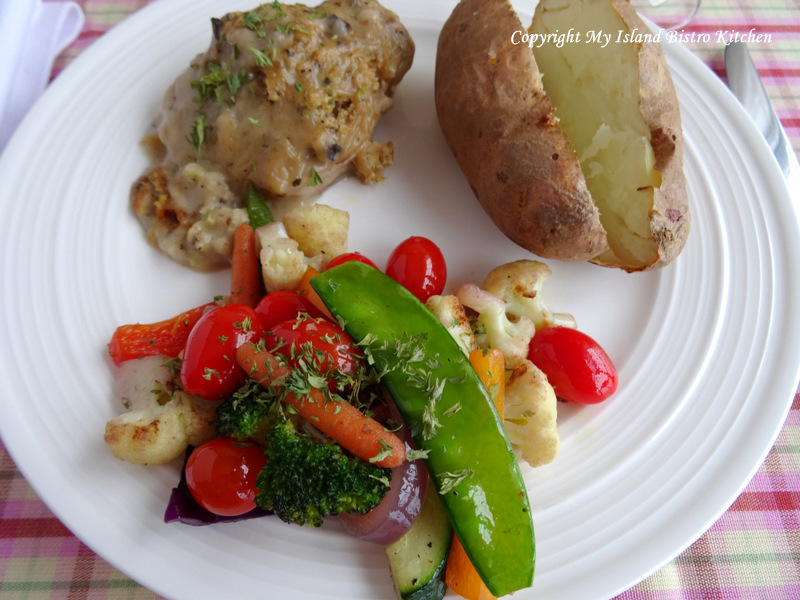 This can be served with your choice of potato or rice but baked potato goes particularly well with this meal along with a side of your favorite vegetable(s). 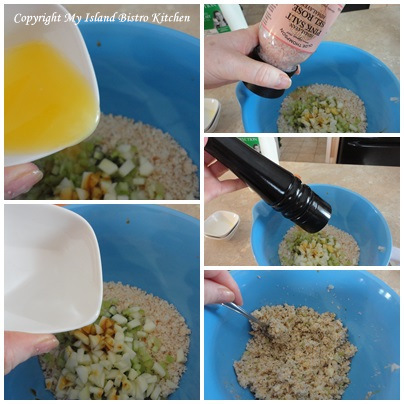 Combine bread crumbs, onion, summer savory, celery, apple, chicken bouillon, melted butter, water, salt and pepper. Stir stuffing mixture well. Set aside. Over medium-high heat, melt 1½ tbsp butter in large frying pan. Brown pork chops, turning each once to brown on both sides. Transfer to greased casserole dish. Combine the cream of mushroom soup with the milk and stir well. Set aside. Using an ice cream scoop, place ¼ of the bread stuffing mixture on top of each pork chop. Pour the soup mixture over the stuffing and pork chops. Bake, uncovered, for approximately 45-60 minutes (depending on size of pork chops), until the chops are tender. Serve with baked potato and your favorite side vegetable(s). 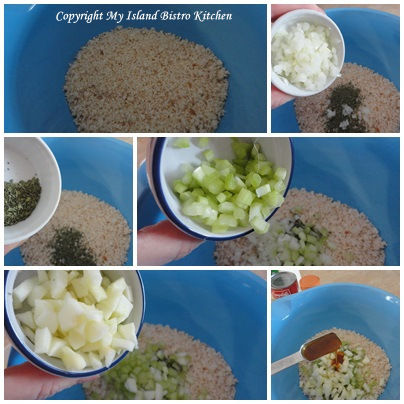 Combine bread crumbs, onion, summer savory, celery, apple, chicken bouillon, melted butter, water, salt and pepper. Stir well. Set aside. Heat 1½ tbsp butter in large frying pan. Brown pork chops, turning each once to brown on both sides. Transfer to greased casserole dish. Bake, uncovered, for approximately 45-60 minutes (depending on size of pork chops) until the chops are tender. 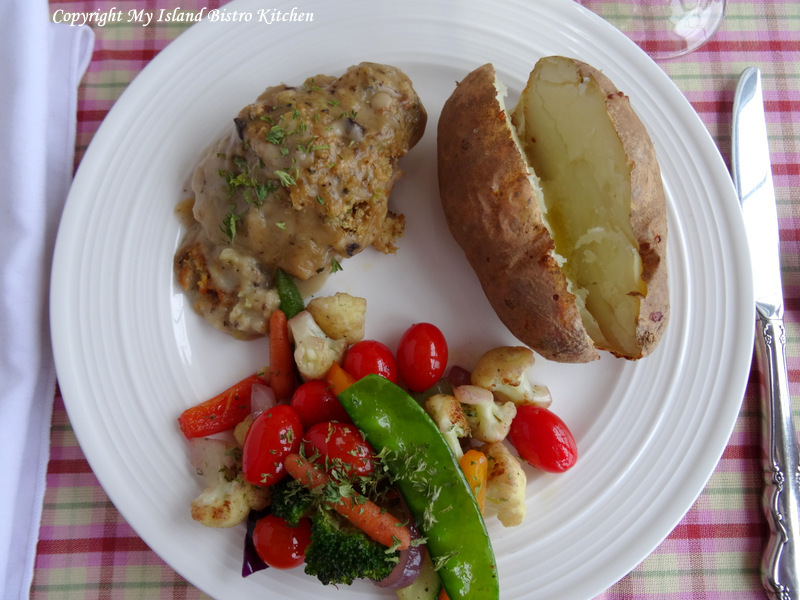 Serve with baked potato and you favourite side vegetable(s).